Custom designed to make HVAC/R Service, Electrical, and Industrial maintenance tasks faster and easier. The AC75B combines a heavy-duty high-capacity 600A clamp-on meter with the most needed DMM functions such as resistance, continuity, and voltage measurement for general electrical troubleshooting. 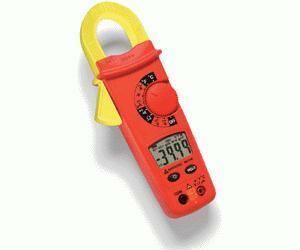 The AC75B then goes further than typical clamp meters and adds extra functions like a Type K digital thermometer, a high capacitance range, and display backlight. The extra features of the AC75B enable more specialized troubleshooting such as measuring flame rod safeguard current and testing motor run/start capacitors.